If you want to achieve the ultimate showering experience, then it is time to switch your single showerhead with two-in-one models. This latest design not only allows you to use two showerheads at the same time but also uplifts your bathroom decor. Dual shower heads are the recent craze as they bring the showering experience to the next level. They not only look unique in your washroom but also offers the luxury you have always been looking for. As most of these models come with multiple settings, you can adjust different pressure and flow settings for each showerhead to make your experience more enjoyable. The good thing is that you can find many latest models from different top brands that offer dual or two-in-one shower heads. In fact, there are so many options available that it may take you weeks to compare and choose the one for you. To make it easier for you, we have reviewed one of the best such options—the Ultra-Luxury 3-way, 2-in-1 Showerhead Combo from Hydroluxe. The Ultra-Luxury 3-way, 2-in-1 Showerhead Combo is the latest Hydroluxe model, which is a luxury brand from IP Showers, also known as Interlink Products. This U.S.-based company only produces showers and boasts 16 different models of showerheads. The Ultra-Luxury 3-way, 2-in-1 Showerhead Combo is designed to work together as well as independently. This means that it is up to you if you want to use both showers at the same time or use the handheld or the wall-mounted showerhead separately. Aside from that, you can also adjust different shower settings to enjoy different water pressure from both shower heads at the same time. It has five different full settings for each shower that include massage, power rain, water-saving economy rain, stay-warm mist, and pause. For this, you can choose the same or two different settings for each shower head to experience the combo. All in all, you get to enjoy 24 different settings. On top of its amazing features and a wide range of settings, the design of the shower is also luxurious. This means that it can add a touch of luxury to any bathroom. Both shower heads are made of ABS high-grade plastic with a faux chrome finish, giving it a metallic look and feel. It also comes with a click lever dial and rub-clean jets that prevent mineral build-up. The size of the head is four inches, which is above average. This showerhead comes with a three-way water diverter along with an anti-swivel lock nut. The overhead bracket is also fully adjustable that allows you to move the shower head with ease. The handheld shower has a 60-inch long hose, providing enough length to move around. The package contains everything you need for quick installation. You can install it without any need to find a plumber or even use a tool. You can use your hands to tighten the conical brass nuts that come with the package. The Hydroluxe Ultra-Luxury 3-way, 2-in-1 Showerhead Combo allows you to bring ultimate luxury to your bathroom and upgrade its look. The unique design can instantly catch the attention of your guests whenever they enter your bathroom. However, its looks are not the only thing to hold on. The shower is also very convenient to use with its dual shower head use and five different shower settings. You can also enjoy both wall-mount and handheld shower experience at the same time. Simply put, if you want to enjoy a variety of showering experience from one shower, this one works best. The handheld shower is made of plastic, which makes it lightweight and easy to move. However, you may have to sacrifice on water pressure if you want to use both shower heads together. 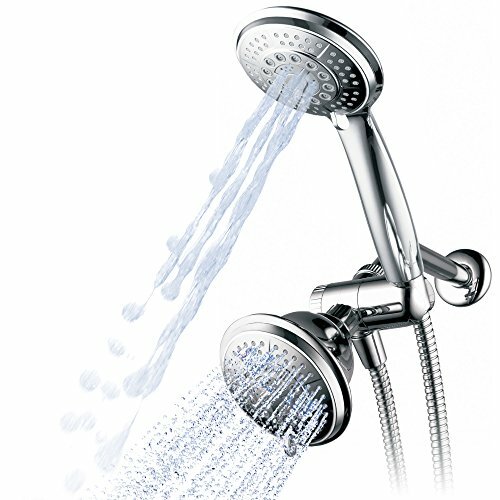 You can also find several other three-way showerheads available in the market that also comes with dual heads. One such model that we can compare the one from Hydroluxe with is the AquaDance High-Pressure Three-Way Twin Shower Combo. First, the major difference between the two is water pressure. If you are looking for a high-pressure showering experience, then the AquaDance is the better option. On the other hand, if you're looking for a variety of showering experience from one shower, then the Hydroluxe is superior because of the five shower settings and 24 functions it offers. Both shower heads offer a maximum flow rate of 2.5 GPM. However, the one from Hydroluxe is a product made in the U.S. while AquaDance is imported from China. Other than their stainless steel hose, both showerheads are made of plastic. However, the one from Hydroluxe looks a lot better. The Hydroluxe shower head is four-inch wide, but AquaDance is only three and a half inch wide. So, which of the two showerheads is better? If you ask us, then we would definitely say that it is the one from Hydroluxe. Why? If you are looking for luxury for the best possible price, the Hydroluxe Ultra-Luxury 3-way, 2-in-1 Showerhead Combo is the one for you. Although the price and features of both the products are the same, the one from Hydroluxe is better because of its whopping 24 different functions! In addition to that, you can also use either both showerheads at the same time or use one at a time; it is up to you. All in all, this showerhead offers you luxury, convenience, variety, and looks—everything you may want in your showerhead but for a very affordable price.